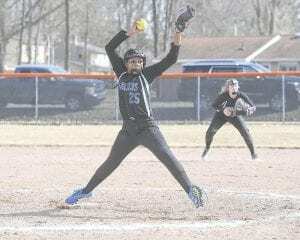 FLINT – The Carman-Ainsworth softball team picked up a key 6-4 win before falling in the nightcap, 22-4, against Saginaw Heritage at home on Monday. Hannah Thurston, Kloelyn Shann and Rayanne Leach each had a pair of hits. Brown registered a triple and Kayli Holbrook added a hit. In the nightcap, Shann recorded two hits and Thurston, Abbi Pelky, Tanya Jefferies and Morgan Croskey all had one. Brown recorded another triple and Daniels a double. Friday’s doubleheader with Clio was canceled and has not yet been rescheduled. It was a tough night for the Cavaliers with losses of 26-0 and 18-0 against Kearsley at home last Thursday. The Cavs also took a pair of losses, 13-17 and 3-12, at Flushing last Wednesday. Sarah Roe racked up two hits and two RBI in the opener before injury took her out of the game. Holbrook piled up four hits and Brown tallied four hits with three RBI, including an in the park homerun. Shann totaled four hits with a pair of RBI, Pelky had two hits and Leach two hits and a RBI. – B.P.